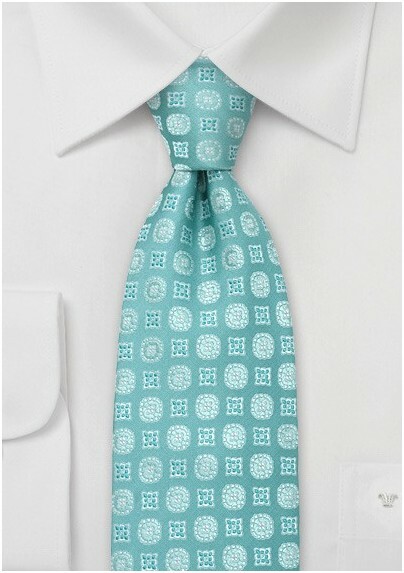 Instantly update your menswear essentials by mixing them with creative and innovative fashion forward colors and designs like this geometric patterned necktie in mermaid blue. The combination of cool blues, whites and silvers is tremendously versatile. This handwoven accessory is a signature design from the well-respected Chevalier Menswear Fashion Collection and is beautifully crafted from a premium European silk. 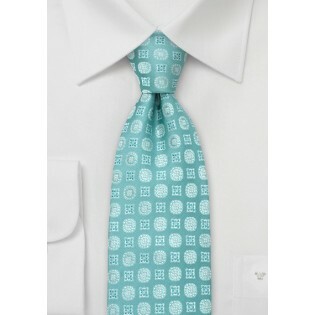 We love to see this tie layered on a classic, stark white dress shirt and soft grey cotton suit.